Tastebook is a sensory training initiative which shares the experience of appreciating, describing and understanding the quality of extra virgin olive oil (EVOO) and table olives from a national perspective. This initiative, first of its kind in Australia, is a unique opportunity to facilitate and stimulate an industry conversation on EVOO and table olive quality and to move competition judging from reactive to pro-active. This program brings along participants from sensory panel members, judges in olive oil show-judging, growers, producers to one platform to assess and evaluate same samples in their own environment- assessing their characteristics, and providing valuable insight not only for describing the oil and the table olives, but also on the style, quality and potential uses of the sample products aiming to expose industry participants to regular sensory experiences and palate calibration for olive products nationally. This program also exposes participants from international arena to assist in gaining an understanding of how to achieve superior product excellence for Australian olive oil products. The Tastebook links to the Australian Olive Association (AOA) competition judges and industry e-learning modules offered by River Murray Training (RMT) with support from AOA and Horticulture Innovation Australia (HIA). Tastebook is a component of a broader professional development platform for competition judges to encourage a conversation on judging methodology and enables benchmarking of participant performance against senior judges. Facilitate improved industry awareness, knowledge, skills and capacity in sensory assessment of EVOO, table olives and other olive products. The Tastebook- Round 1 was successfully introduced in December 2016 and concluded by March 2017. The Round 2 of Tastebook was initiated around March 2017 and concluded in July 2017. A total of four samples were sent to participants within Australia and abroad (Argentina, New Zealand and USA); two of each sample are EVOO and Table olives (TO), respectively (Table 1). Every participant was encouraged to evaluate and assess one sample of olive oil and table olive (along with the four samples) from their own as a benchmark against the tasting samples provided. There were sightings of yeast/mould in some Table olive samples distributed during Round 2, which prevented some participants from organoleptic tasting. Improved packaging technology is considered for future Tastebook rounds to avoid reoccurrence of this phenomena. A total of 91 participants have responded in Round 2 of the Tastebook program with valuable insight about how the judging was conducted at individual level. The “judging experience” of EVOO and the Table olives of the participants are presented in Figure 1A and 1B- which reflects a large number of participants are the olive oil enthusiasts or the producers who would like to understand the olive oils better or to improve the quality of the Australian olive oil products. The level of participation from the judges or the panel members for both EVOO and the Table olives is encouraging and for the future rounds, it is recommended to reach out to more participants. The average score and the possible Medals for each sample is reported in Table 1. It is important to remember the learning intention of this program and the diversity of the participants’ experience in evaluating EVOO and table olives. Hence, the scores should be taken into consideration with its true purpose and this evaluation should provide a national platform to initiate the industry conversation. To understand how every participant has evaluated the EVOO, the rating/score was analysed for each level of participants’ experience- such as Level 1/2/3. Table 2 represents the scoring comparison for each level of participants (including male and female), where the mean score/rating (average) and the standard deviation (SD) were calculated and reported. Higher SD value refers to the lack of consensus among the participants in scoring the EVOO. 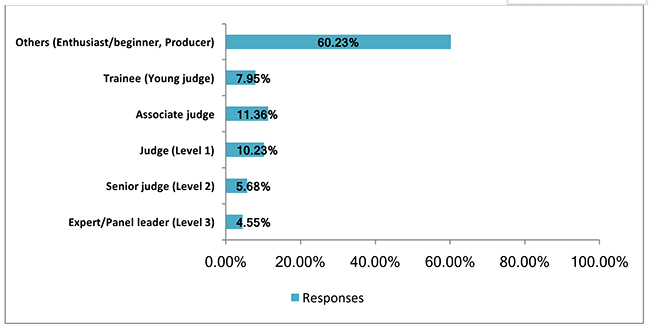 This was reflected in the higher SD values for Associate judges, Trainee judges and “Others” (Enthusiast/beginner, Producer) compared to the SD value for “all participants together” (Table 2). 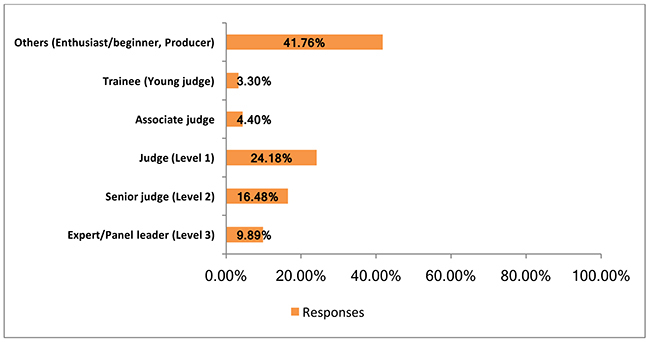 However, Level 1, 2 and 3 judges were more consistent in their scoring and sensory evaluation, and thus lower SD values. This implies that more training will be required in future to streamline the sensory evaluation and scoring of EVOO nationally. Frequent participation in the Tastebook program would facilitate increased awareness of olive oil sensory attributes among the participants. 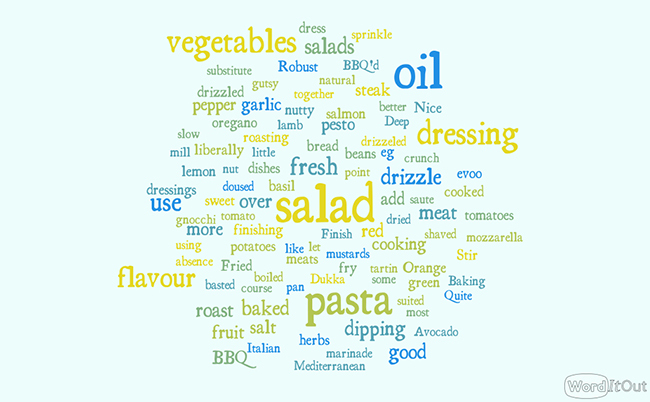 To visualise better how each sample was perceived and described by the participants (irrespective of their own experience), a “word cloud” was developed to summarise the feedback (Figures 2, 3, 4, 5). 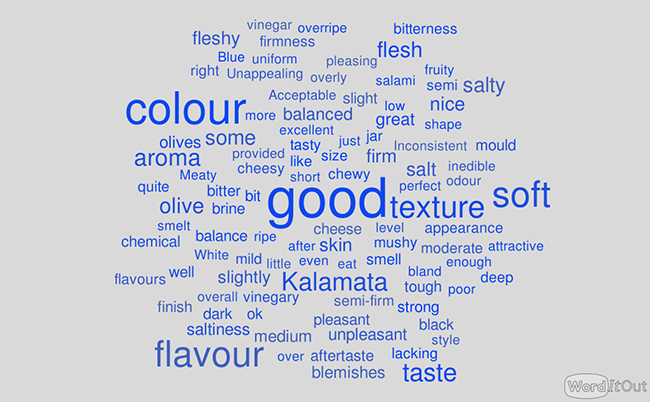 To read the word clouds easily, one has to identify the “size” of the words mentioned inside the cloud- the bigger the size of the descriptor, the more frequent that particular descriptor is repeated within participants’ feedback for each sample. For example, sample E was perceived as EVOO with “mild intensity in aroma and pungency, with herbaceous, grassy finish”; whereas sample F was perceived as EVOO with “fresh green aroma, with pronounced intensity in fruity aroma and pungency, having a lingering finish”. 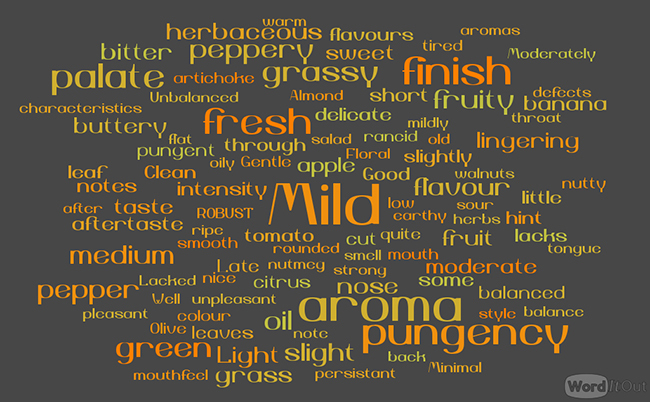 The participants were asked to provide insights about enhancing the two EVOO samples from a blender’s perspective. The most common recommendation for sample E was to blend it with a more robust oil (from Manzanillo/Kalamata or Coratina) to intensify the fruity notes with a lingering peppery finish; some participants are happy with the oil as is- because of its mild delicate notes. Participants have also made comments about the sample E giving a tired palate that maybe a reflection of this oil being old and the need to store the oil correctly. Sample F was favoured by most participants to keep it as is- this oil was perceived mostly as medium oil with lingering pronounced pungency. Some participants would like to see this oil’s complexity on the nose to be improved further, hence blending with Frantoio or Leccino was recommended. When the participants were asked if “they would like to do something different” for each sample from a harvester/processor’s perspective, the most common feedback for both EVOO samples was to harvest/pick the olives early. Other most frequent suggestions were regular checks for malaxing temperature and contamination, prompt processing and better storage in stainless steel containers under inert gas at a cool temperature. Participants were curious about the information on Sample E- to understand if this was a 2016 or 2017 oil and if it was a varietal or a blend. Similar approach was taken into consideration for analysing the open-ended descriptors for the two Table olive samples. 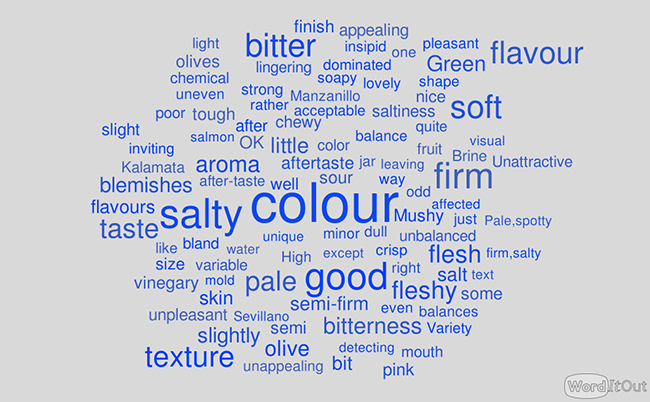 Figures 4 and 5 details the word cloud reflecting participants’ feedback and perception about the most suitable descriptors for both samples. Sample H was perceived as good even sized Table olives of mixed colour without blemishes, moderately aromatic reasonably firm texture within fingers but softer in mouth, average flavour with slight but noticeable off flavour, lacked bitterness but had higher salt levels. Sample I was identified as Kalamata Table olives by many participants; this sample was described as having even good colour, soft flesh, good pit to flesh ratio, some blemishes, balanced taste profile with vinegary aroma. Like the EVOO, the participants were also asked if “they would like to do something different” for each Table olive sample from a harvester/processor’s perspective. The most common feedback for Sample H was to adjust the salt levels in the brine solution, followed by early fruit picking, regular checking of the processing condition and longer processing to remove the lingering bitterness. For Sample I, early fruit picking was the most frequent suggestion as it would lead to desirable firm texture; some participants have mentioned about the off-aroma of the brine solution for Sample I, although the brine aroma did not translate into the final fruit flavour and taste profile. In their open-ended comments, most participants were concerned about the colour of the Sample H- yellow/light brown/straw colour which was perceived unappealing to most of them. The mould sightings inside the Table olive samples made them inedible for some participants and this was raised as a concern for future rounds of the Tastebook. Every participant was asked to suggest a recipe using either the EVOO sample or the Table olive as the main ingredient. The participants were generous in their suggestions which were reflected in the diversity of recipes and the subsequent usage. Figures 6 and 7 detail the recipes for two EVOO samples (Sample E and F, respectively); whereas Figures 8 and 9 describe the recipes suggested for two Table olive samples- Sample H and I, respectively. 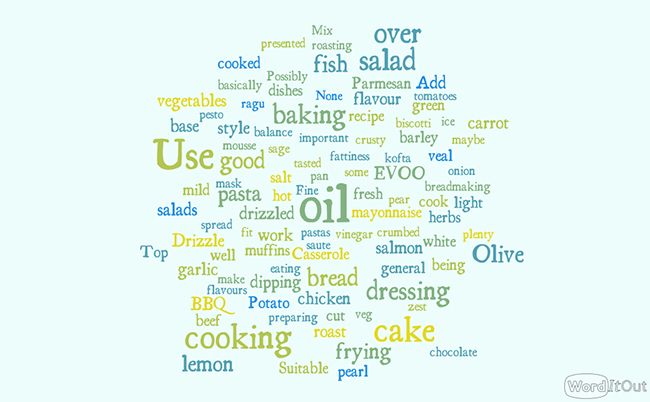 The most common suggestions for Sample E were to use this EVOO sample for everyday cooking, baking or frying (BBQ). Because of its mild delicate flavour, Sample E was considered suitable for baking cake, using it in the salad, pasta or in dressing (Figure 6). 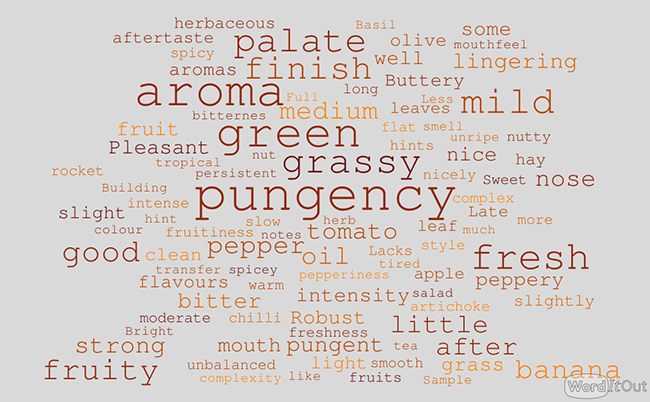 Sample F, on the contrary, was considered most suitable for using as a main ingredient in salad dressing, pasta or drizzle over baked vegetables (Figure 7). There are similarities in the suggested usage for Table olive samples. 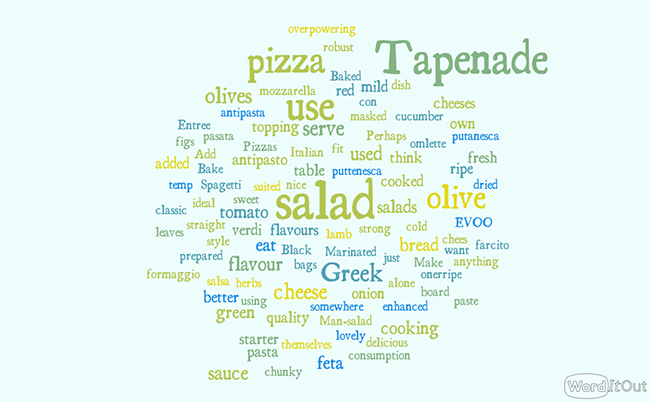 Both Samples H and I can be used “as is”, or as an ingredient in pizza, Greek salad/general salad and Tapenade. Though, there is a strong consensus among the participants for Sample I to be recommended for making Tapenade followed by using it in the salad and pizza, compared to Sample H (Figures 8 and 9). The uniqueness of the Tastebook program lies in the way the samples were evaluated- as the EVOO and table olives travel to every participant’s home instead of a central location tasting of samples. This uniqueness and the initiative were appreciated by most of the participants in Round 2 of the program, although some participants were not happy with the tasting format. For many participants who are beginners or did not have enough judging experience, but keen to learn more- this opportunity opens new avenues for organoleptic evaluation sitting in their own homes. The use of online SurveyMonkey system to capture participants’ feedback gathered positive responses, however some participants had difficulties in completing the evaluation online in one sitting. It was suggested for some senior judges to taste each sample before posting them, so that participants can access their results and descriptors and assess if there are any differences. Some participants expressed their intention to take part in olive oil training to provide better judgement and appreciate the olive oil better. The professional presentation of the samples and the packaging by Orana in Round 2 were commended by the participants; however future emphasis should be given on presentation hygiene, sample handling and more aseptic packaging without damaging the Table olive quality. Some participants found it difficult to suggest recipes and processing suggestions; similar feedback was received for blending suggestions. 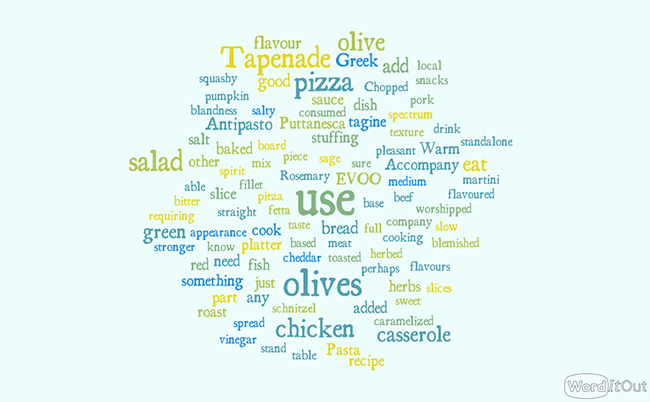 In summary, the Round 2 of the Tastebook online electronic version provided a distinct benefit to most of the participants to assess olive oil and table olive samples remotely. The professional approach of sample presentation and packaging, better communication/information, practical thought-provoking questions, easy navigation through the online survey, along with clear instructions and valuable notes were some of the notable mentions in participants’ open-ended responses about their key liking points for Round 2 of the Tastebook initiative. With every learning opportunity, there lies possible improvements. Participants were open and honest in their feedback about how to improve the future rounds. Better guidance and instructions should be provided for those who do not have any extensive training or exposure to olive oil organoleptic/sensory evaluation. Some aroma training exercises for those with inexperienced noses, sharing a video of a sensory panel leader/senior judge showing how to evaluate EVOO and Table olives- so that every participant will have the common background to start with. Suggestion was given to attach a flavour wheel with possible descriptors to facilitate organoleptic evaluation. It would be great to provide feedback to the growers/processors about the harvest and processing notes, along with farming, as farming technical decisions have a huge impact on oil quality. Some participants have expressed their views to have samples with notes as exemplary from experienced judges, and calibrate their own results for benchmarking. One of the possible inclusion for Round 3 would be the plastic tasting cups, as some participants do not have them at home. Participants have also provided feedback about the sample presentation. For most of them, the sample presentation in Round 2 was simple, practical and user-friendly- a definite improvement than Round 1. Samples were well-packaged, no spills, labelled properly, with adequate amounts for organoleptic evaluation- the small compact packaging worked well. However, there was concern about the handling and hygiene of the Table olive samples. For some participants, both Table olive samples displayed white surface spots of microbial growth. The suggestion was not to use new sample bottles without pre-heat treatment; jars and lids should be heated to minimum 80 ᵒ C prior to use; washing is an option. Other options include (1) replace screw cap lids with twit top lids, (2) review sample brine strength range and (3) use a neutral olive oil film to cover brine and olive surface prior to sealing with lid. The Tastebook initiative is a fantastic opportunity to bring together participants who are keen to hone their expertise in appreciating and understanding Australian olive products. To date, two rounds of Tastebook have been completed and the knowledge generated from this exercise is immense. Now it is the high-time for the Australian olive industry to share these findings with the broader audience and explore the future possibilities of continuing regular tastings. The next step is to secure industry funding to continue this initiative on a quarterly basis and to send out samples to all national, state and regional competition judges and associate judges, as well as to trainees including young judges and AOA Code of Practice Signatories (now rebranded as OliveCare™), and to other interested industry participants. The author would like to sincerely acknowledge and thank Shane Cummins, AOA Chief Judge and the Tastebook Convenor and Peter McFarlane, Convenor- National Table Olive Committee (AOA) for their continuous support, patience and strong belief in making this unique Tastebook initiative successful. About the Author: Dr. Soumi Paul Mukhopadhyay is a sensory and consumer scientist who has successfully completed her PhD from Charles Sturt University (CSU), Wagga Wagga, Australia in 2015. She has over seven years of FMCG industry experience in several global giants like Nestle, Whirlpool and Goodman Fielder. She is a trained member of the Australian Olive Oil Sensory Panel at Wagga Wagga and has had extensive palate training. Recently Soumi has moved to her new role as Research Horticulturist- Sensory and Consumer Science with Department of Primary Industries (DPI), Wagga Wagga.